Will your team make the College Football Playoff? Over on Bleacher Report, I posted my probabilities for each team based on the current committee rankings and simulations of the season. 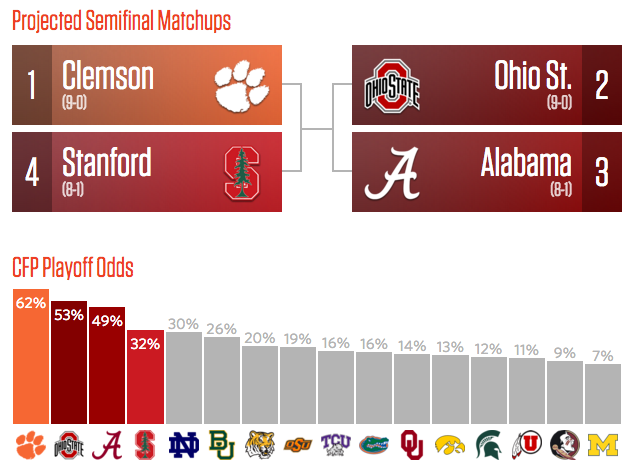 Clemson has the highest chance after their win over Florida State, while Stanford edges out Notre Dame for the fourth highest probability. To check out all the numbers on Bleacher Report, click here. It’s also work checking the same calculation by FiveThirtyEight. They have Baylor a bit higher and LSU a bit lower, but otherwise the two sets of calculations give roughly the same results. Does Notre Dame necessarily make it if they win out? How the hell did Iowa jump Baylor in the rankings? How does new Baylor QB Jarrett Stidham change their odds? I also did this calculation last week, which I forgot to post on the blog. To check out the numbers after the first committee rankings, click here.